Picture a desk without papers strewn everywhere. You may ask, �Where did all of the paperwork and media files go?� Nestled among your Office Furniture, you will find media filing cabinets, a binder storage rack, some media storage, and filing cabinets with locks. Fireproof filing cabinets and HIPAA compliant file cabinet storage keep thieves, nosey people, and disasters from ruining your files and credibility. Metal filing cabinets and file cabinets on wheels blend with any d�cor and can be moved around easily when you�re feeling the need for change. 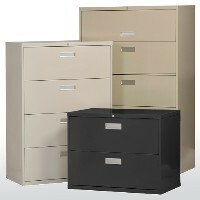 Lateral file storage cabinets and vertical file storage cabinets keep blueprints, hanging files, and other paperwork or media securely hanging or lying flat. For more blueprint storage and artwork portfolio storage, check out the Artist and Engineer File Systems. Media filing cabinets, insulated file cabinets, and binder storage are just a few ways to store media, DVDs, CDs, and Hard Drives safely. Tech Carts are also a great way to specifically store media and technology while charging it overnight and moving it around offices and classrooms. Check out all of the Shelving, Storage, and Organization items available! For additional security, US Markerboard offers a selection of Safes, safe doors, and fireproof safes with relocking features. File that information under �good ideas�!